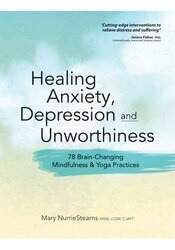 Transform your feelings of anxiety, depression and unworthiness into loving self-acceptance. Mindfulness and yoga authority Mary NurrieStearns has created a compassionate and practical workbook that provides a caring healing journey. 78 brain-changing practices help you focus on life-enhancing thoughts and actions, which leads to self-understanding, and living with meaning and peace. 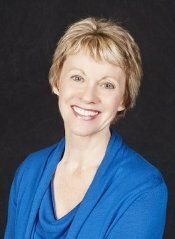 Mary NurrieStearns, MSW, LCSW, C-IAYT, an advanced-level yoga teacher, certified yoga therapist, ordained member of Thich Nhat Hahn's Order of Interbeing, author and retreat leader. She is author of the Daily Meditations for Healing and Happiness Card Deck; co-author of Yoga Mind, Peaceful Mind; Yoga for Emotional Trauma; Yoga for Anxiety; and co-editor of Soulful Living. Mary has suffered from anxiety and emotional trauma, and credits mindfulness practices for profound personal transformation.